You may have heard about the “Terrible Twos”, but what about Terrible Teething? Your little baby may be a little thrown off by those chompers coming in, but teething doesn’t have to be terrible. Just knowing what to expect is an important part of teething, and hey, you’re reading this so you’re on the right track! Once you know what to expect, there are a few ways you can comfort baby. Babies typically get their first tooth between 6 and 12 months and teething can begin as early as 3 months old. Both teething and when the first tooth appears vary greatly from baby to baby. 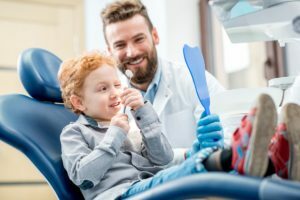 So no need to worry if baby gets their first tooth sooner or later because there isn’t a set milestone for a first tooth. Most adults don’t give their baby teeth a second thought after their last one is lost and the tooth fairy makes their final visit. But they’re important because baby teeth help your child talk, chew, and even smile! Not only that but they hold the place for adult teeth. But for something so important, it isn’t much fun when they first come in. -Fussing/Crying: Most parents say they notice baby is a little fussier than normal when teething begins. Remember, teeth coming in can be a little painful, and since baby can’t tell you that, it can lead to some irritability. -Biting: Biting is a major sign of teething! You may notice baby started chewing and biting on everything in sight. They do this to help cope with any pain they might be feeling. Giving teethers can help because they’ll be chewing on something you give them, and you know it’s safe to go in their mouth. –Loss of appetite: Refusing food is another common sign of teething. Because baby’s gums are sore, they refuse some solids they were previously enjoying. -Drooling: It’s common to see more drooling than normal from baby when they begin teething. This is common because the saliva helps cool gums, which can be comforting to baby. Many people often associate fever with teething but fevers over 100 degrees Fahrenheit are not normal. Contact your baby’s health care provider if baby has a fever, rash, diarrhea, or their gums become purple. Washcloths and Toys: Chilled but not frozen is the key to remember when trying to comfort your teething baby. A toy or wet washcloth can be put in the freezer for a couple minutes, so it’s cold but not frozen, before given to baby. You can give these items for baby to chew on, or use the washcloth or your finger to massage baby’s gums. Avoid toys that are frozen solid or toys with gel that a tooth might be able to puncture. Fingers: Baby will love your fingers! If their teeth haven’t poked through yet, try rubbing baby’s gums to help comfort them. Routine: Trouble sleeping is often a common sign of teething so keeping baby’s sleep schedule, and all their routines, in place will help make them feel comfortable. Teething isn’t fun, but don’t let it be terrible. These tips will help you know what to expect and help baby feel comforted until they have a smile full of teeth! Want more info on baby’s development? Get even more tips for comforting your baby! Once those chompers poke through, start making trips to the dentist. These ideas can make it fun!